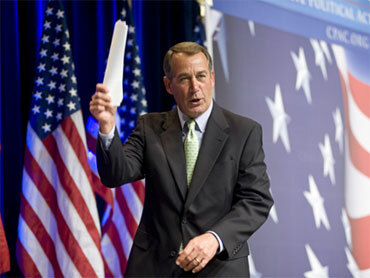 CPAC Convention, Washington - What if Rep. John Boehner was Speaker of the House? That's the picture the current minority leader wanted to paint for his fellow conservatives at the Conservative Political Action Conference today. As part of his introduction, audience members watched a montage of big Boehner moments on the House floor this past year: Boehner dropping the Democrat's health care bill on the floor in disgust, Boehner reading parts of the Democrat's cap and trade bill on the floor to make his point that members had no idea what was in it. Boehner's speech was a list of promises that were meant to get the Republican base even more energized as they fight to take back the House in 2010. He called on these already-loyal conservatives to recruit their friends and neighbors in the fight. "If you will help me elect a Republican majority this November." Boehner promised, "we will be open, we will be transparent and we will listen." Boehner promised that Republicans would "post every bill online for at least 72 hours before it comes to the House floor for a vote." Boehner pledged that Republicans would listen to the American people, and he tried to reach out to the different factions of the conservative base. "We're going to listen to things like the Contract from America. Have you voted for or against John Boehner ? We're going to listen to things like the Mount Vernon statement. We're going to listen to the Tea Party movement," Boehner vowed. "We're going to listen to them, we're going to work with them, stand with them, and walk among them." The Republican leader warned his audience to set realistic expectation if Republicans succeed in taking back the House in the fall. "A Republican Congress is not going to change the world in two years," he said. "We . on't. We can't. But we can stop the Pelosi-Obama agenda."